Choose My Plate is the newest healthy eating guide from the USDA and it is full of great ideas about portion and proportion balance. 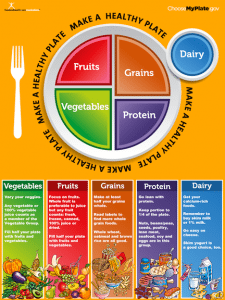 Learn about ways to create a healthy diet with our wide range of MyPlate education materials and resources. We discuss everything from navigating ChooseMyPlate.gov to deciphering each part of the new icon. We even have MyPlate resources in Spanish. Review our MiPlato poster and MiPlato handouts today! See our My Plate Kids Posters and Handouts. And choose from many different styles of My Plate Posters. Food and Health Communications, Inc. is proud to be a National Strategic Partner for MyPlate .